When my husband and I got engaged on Christmas, the year before last, the first thing my sister-in-law, Anastasia, said (after all the hugging and squealing) was, “Let’s go to David’s! !” So, four days later, we did. 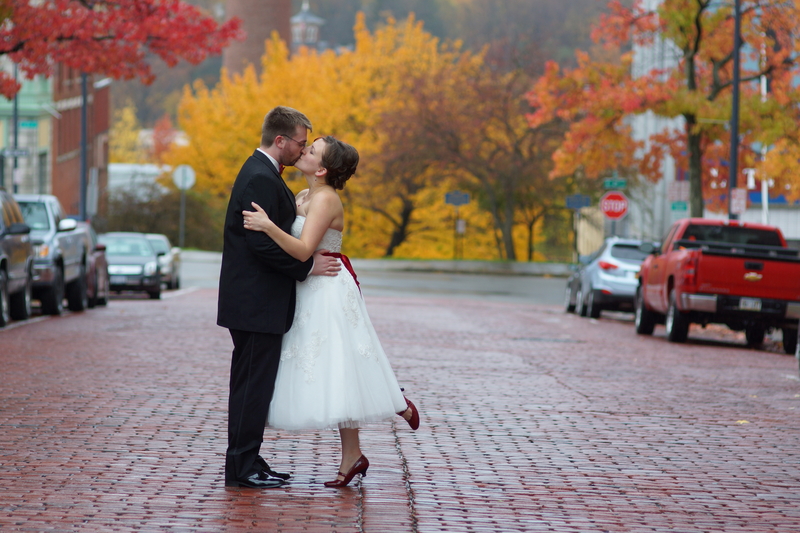 Nic and I had been talking about marriage (both jokingly and sincerely) since before we started dating, so it wasn’t a completely new idea, but still, the reality of actually, finally, growing up, finding true love, and getting hitched still felt like a total made up dream. 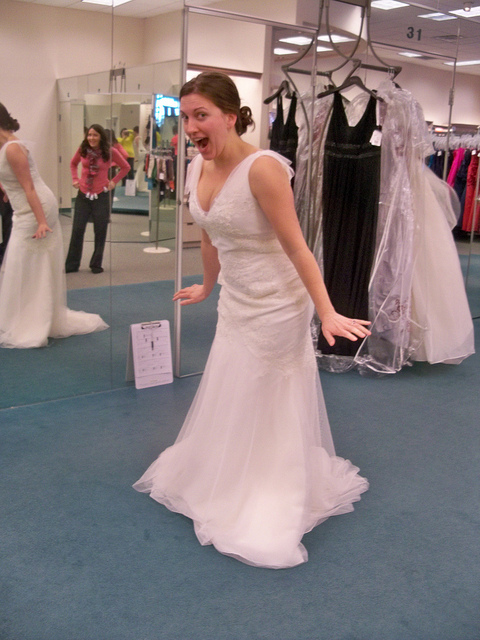 And so, trying on wedding dresses was a weird and exciting prospect. 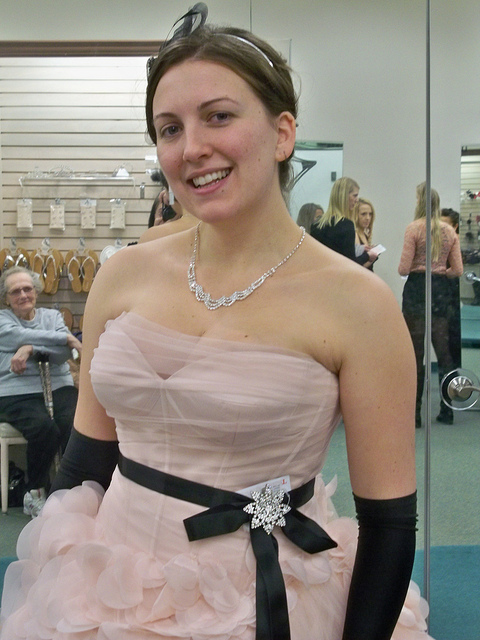 From the start I knew I didn’t want a ballgown (This has baffled me about formal occasions generally for years. How do you dance to pop music in a long floofy dress? I mean, really!) and I really didn’t want to wear white. 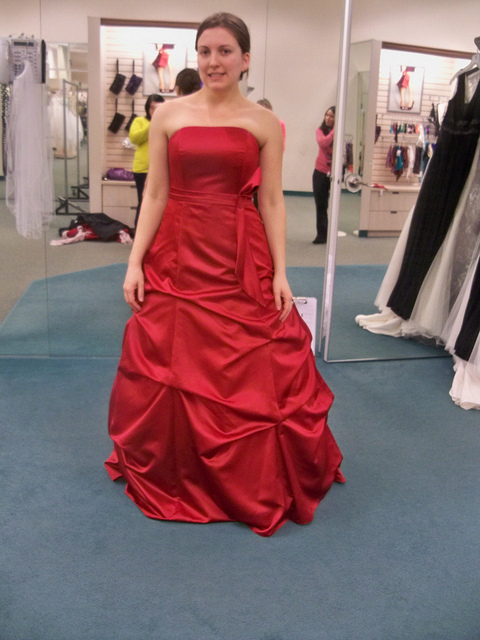 I wanted a red dress. I knew that much. And I really loved the idea of a tea length dress. But I also knew that what you think you like might still not be the best match when you actually get close enough to it. So, I tried on EVERYTHING. Every style they had available, I put one on. Anastasia picked out some of them and we agreed on a few and I picked out most and our amazing attendant Maria picked the rest with my requested parameters and a few surprises. Some of them were so ridiculous that we couldn’t stop laughing, because, OMG How does anyone walk in these things???? 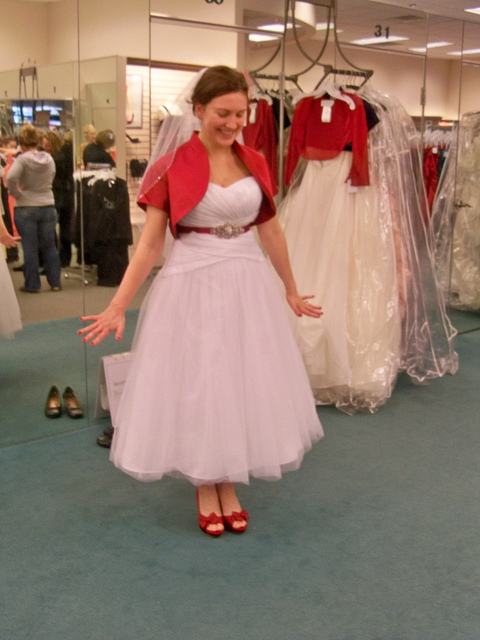 I tried on a fully red dress, and was insanely disappointed. 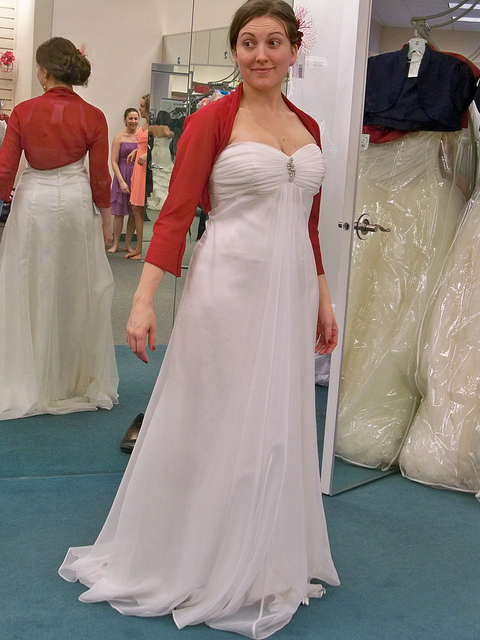 I think it’s mostly the awful bodice design, but again, I just didn’t feel perfect. The skirt I love, but it had to be the whole package. 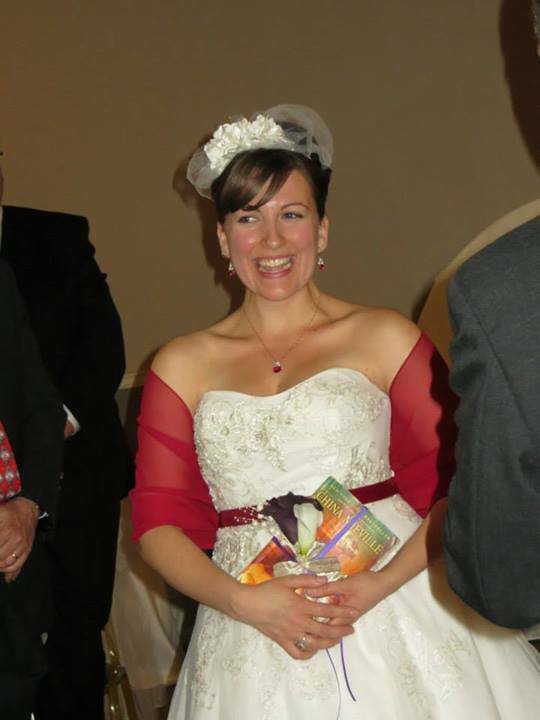 A gorgeous mixture of white and red was at the forefront of my options and even though I had said, No veils!, Maria placed one behind the tiara, comb tucked into my brown locks, and I turned to look in the mirror, and burst into tears. Anastasia did too. And that is when I realized that I was actually going to be a bride. I was really getting married. This gown became my top pick. 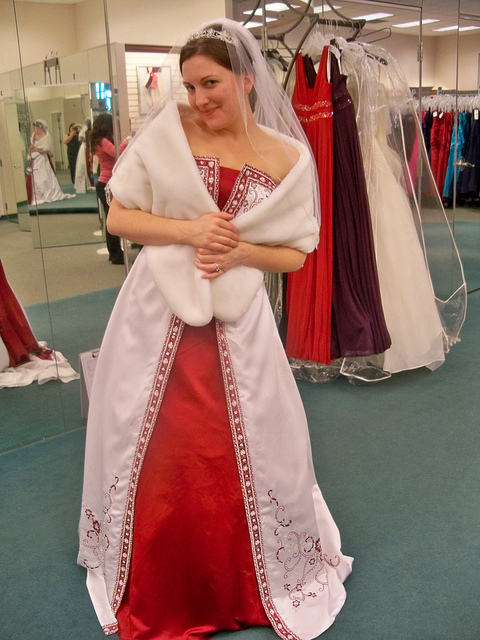 I call the dress that flipped the YOU’RE A BRIDE switch my Russian Disney Princess dress. I mean, seriously. 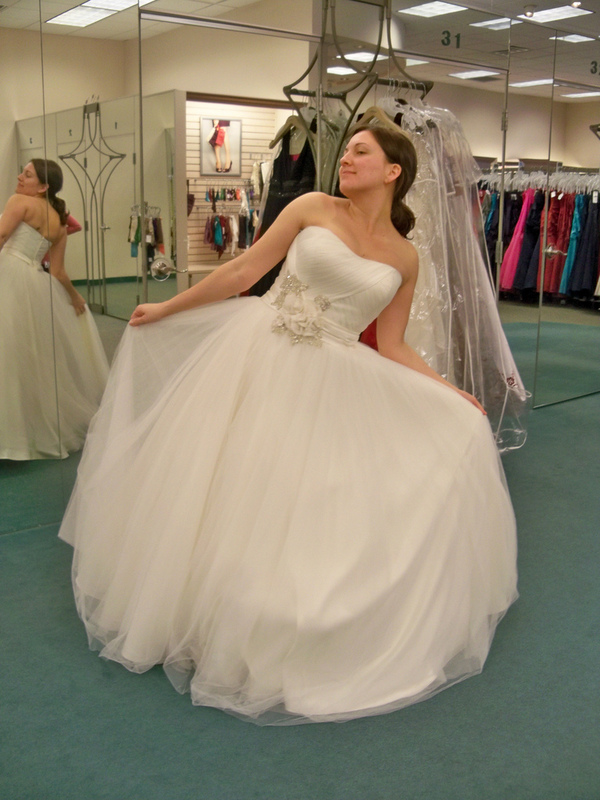 During my two initial visits to David’s, I tried it on twice more, but ended up dropping the idea when I realized that it would be too much work to make the train lay right as I walked down the aisle and up to the stage, and then to fix the bustle and also to be able to move like I really wanted to be able to at the reception. So, I went back to trying on other dresses. It’s kind of a shame we nixed this one, not just because it was so beautiful, but mainly because we immediately found a bridesmaids’ dress that fit perfectly with its lines – a prospect that would become horrifyingly difficult with all the favoured options. I actually tried on the black one for myself first, but that’s when I realized that finding the perfect dress would be signified by the bizarrely profound sense of Feeling Like a Bride. 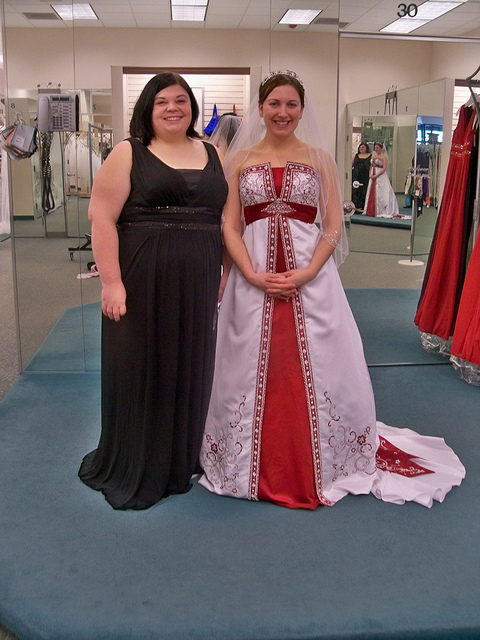 I could wear that black dress (in the gorgeously perfect apple red) all day long every day. It was that comfortable. But feeling like the co-star of the show of my lifetime did not happen. Apart from the cost, I kept going back to the reception. It would be weird to rock out to Bon Jovi while dressed like Grace Kelly. I would do my best if I had to, but it did feel a bit strange. 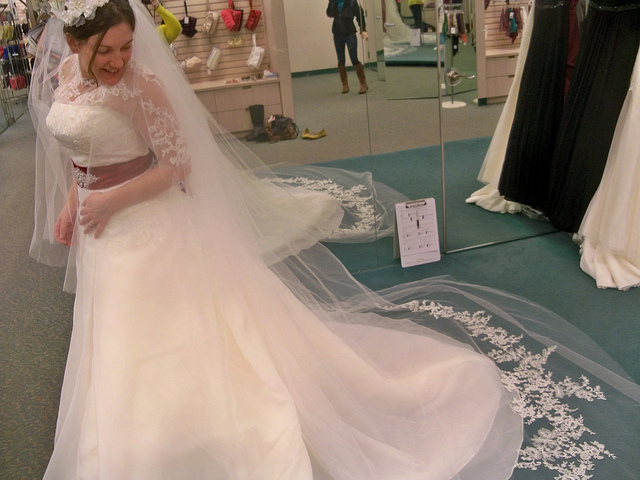 On the day I tried it on, this next dress did not Wow me, but looking back, if I ever had to go through the horrendous task of planning our wedding again, I think I might choose this dress. There was no train to fuss with. It had gorgeous accents already part of it. And it was very comfortable to move it. It was silly and floofy. But it was very Cinderella, and that was my favourite childhood fairy tale. 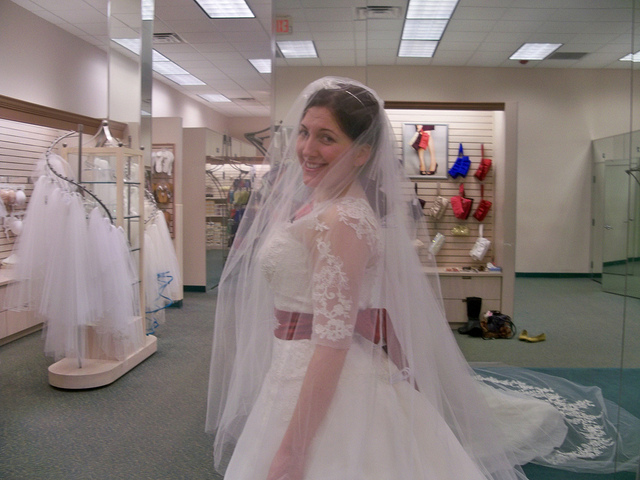 I didn’t find the gown I wore for our wedding until our second trip to David’s Bridal, when my Mother-in-Law, Grandmother-in-Law, Sister-in-Law/Maid of Honor, Bridesmaid/Oldest Friend, and Honorary Bridesmaid were all with me. It was both overwhelming and reassuring to have that many opinions in one place. Because, when the entire room full of women start crying at the same time, I’ll tell you what, you know you’ve found The One. It’s like that moment in Harry Potter and the Philosopher’s Stone, when Harry meets the Phoenix and Holly Wand for the first time, and there’s a warm glow and everything just feels right. (Again, this is what finding the right partner feels like, too.) 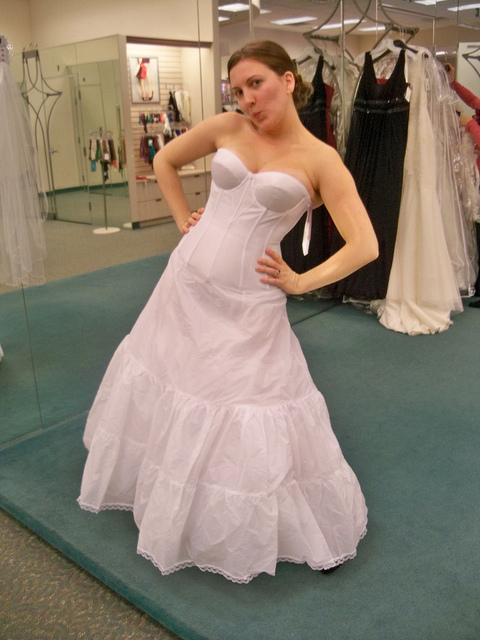 On this latter trip, I continued trying a variety of styles before I finally found My Gown. Some of the gowns I tried were so beautiful that I felt like I was on a 1930s film set. I felt like I’d stolen this dress from some starlet and was wearing it illicitly. 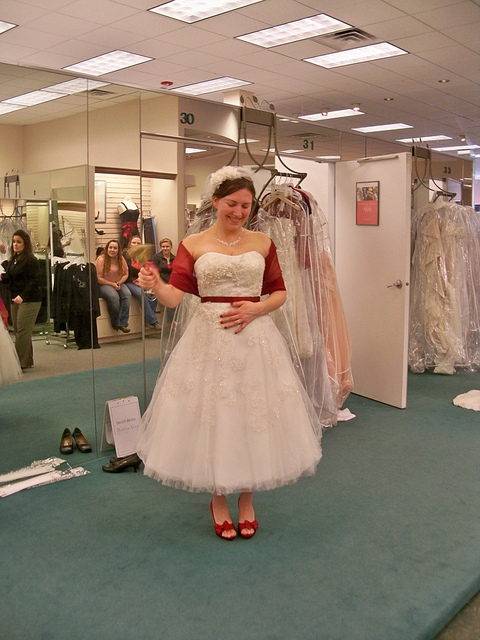 It was awfully fun to wear for a short time, but I didn’t feel like myself in the least. Other dresses were just plain silly on me. Soap Opera Night Gown, anyone? 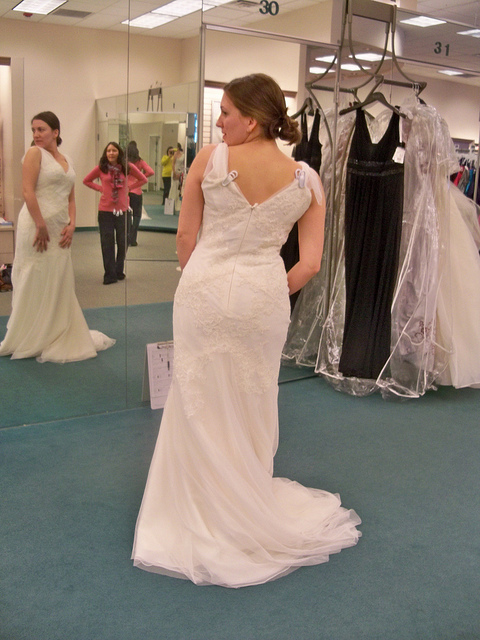 I was starting to feel like I might as well just wear the undergarments they give you to fill out the dresses properly! I stopped and thought. She was absolutely right to question it. So, I turned to Maria and asked what else she had that was similar. She brought two. I never tried on the second one. Somethings don’t need to be questioned. 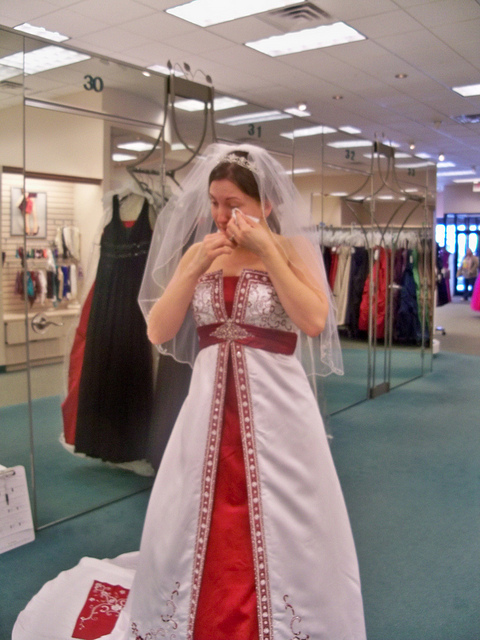 This is a very sweet tradition at David’s for when a bride finds the perfect match. Ringing the bell gave me the elation of something real and beautiful happening. Finding the perfect match is kind of a big deal. Finding a beautiful dress isn’t bad, either.